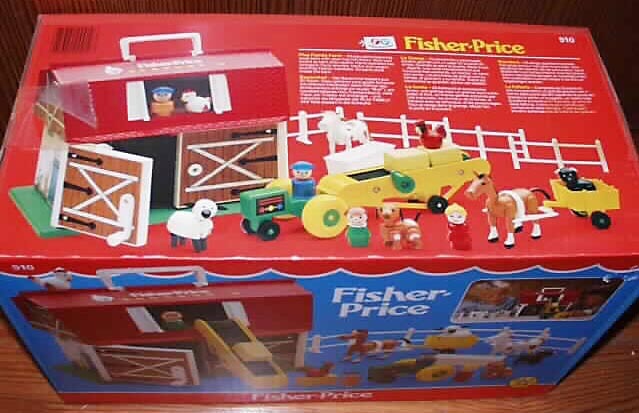 Description: As America enjoyed nearly 2 decades of the red and white play-and-carry #915 Play Family Farm, Fisher-Price sold the #910 Fisher-Price Farm in Europe. While both farm bases are similar in shape and size, the #910 Farm base has drastically different decals than America's #915 Farm. We are not positive how many years this set was made, but we do have a 1986 Fisher-Price dealer catalogue from the Netherlands that pictures this set. Unlike the #915 Farm, the #910 pictured in the catalogue includes a long yellow conveyor belt that lifts accessory hay bundles to the upper hayloft. The figures and animals are also a bit different than those sold in the #915. The 1986 #910 Farm is pictured with a white pig, a black dog, and a black horse....figures that have not been sold in America since the early 1970's. The #910 farmer figure and son are pictured wearing blue caps opposed to cowboy hats that the #915 figures always have. Farm Base - Barn with a green plastic base and a textured red plastic roof with angled corners. The barn walls have white paper lithos with pictures of Original Little People animals and an orange body boy figure wearing a blue cap. The front has 2 white plastic barn doors with a brown wood-simulated paper litho on the front with a white "X" and 3 black brackets on each door. The door has a white plastic door handle. The left-side door makes a cow-like "moo" sound when opened or closed. The barn has a hay loft with 2 small white plastic hayloft doors above the big barn doors. Long yellow plastic conveyor belt with a black belt on one side. One end of the conveyor belt has a ledge to put a bail of hay onto. The end with the ledge rests on the ground and the opposite end can be propped up onto the barn hayloft floor. 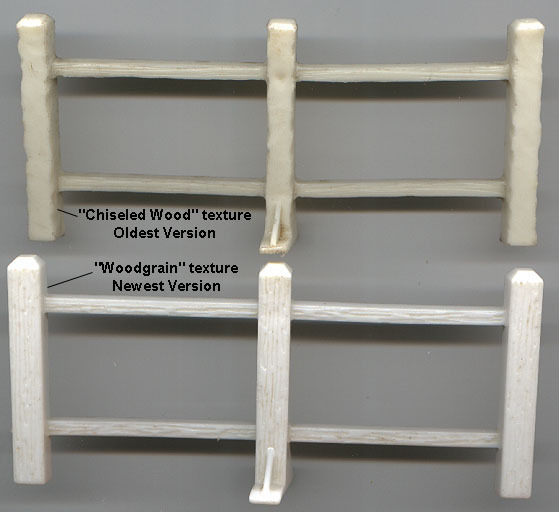 4 each - White plastic fence posts (the posts are textured to look like chiseled wood). Click here for a photo. Yellow tractor with 2 big green plastic back wheels and 2 small black plastic front wheels with yellow plastic axles. The tractor has a small litho attached to both sides of the "engine". This litho has a black background, 2 red bars across the bottom, and 3 colored dots (blue, yellow and red) under the bars. Green hay cart with a hook on front to attach to the tractor or horse harness. 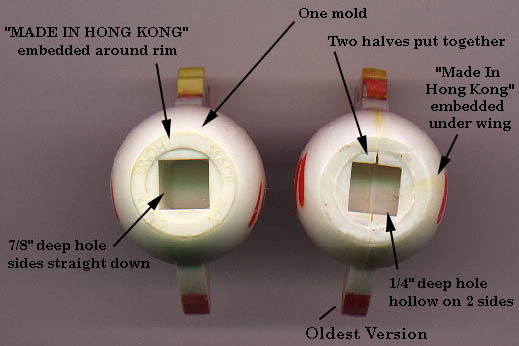 The cart rolls on 2 small black plastic wheels with yellow plastic axles. FPT905 - White horse harness used to pull a cart. The harness has 2 long straight sides that are squared on the end. The squared end fits behind the horse tail and has a C-shaped hook to attach to a cart. The long straight side ends of the harness are connected with a small U-shape that fits over a horse's back. WL - White cow with brown spots, ears, and tail. Black horse with a white mane, tail, and facial features. Black dog with white spots, white black facial features, white ears, and a white tail. YT - White sheep with black ears, black face, and 4 black legs. White pig with brown ears and brown dot eyes. Farmer dad - Blue farmer dad with a yellow non-triangular scarf and a blue cap with bill facing forward and a "M" shape above the bill. Mom - Red mom with fancy eyes and yellow hair in a ponytail. Farmer Boy - Orange boy with a blue cap with bill facing forward and a "M" shape above the bill. LAPP - Girl - Green girl with a brown sculpted bob, red freckles, and black "" eyebrows. Also see America's #915 Play Family Farm made from 1968-1985. 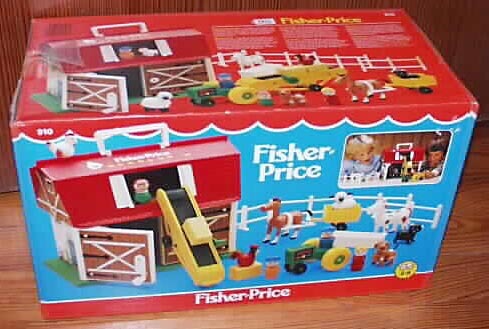 In 1986 Fisher-Price issued a "new" barn set in America as the #2501 Little People Farm. This set comes with a ribbed-roof barn and silo. The barn has a green plastic base, and red hayloft doors.